We cover a lot of bases pretty well here on WGaTJ's. Want to know what we think about any kinda beverage? Chances are, it's covered. Most snacks and desserts? Yup. Bacon-related in any way, shape, or form? Absolutely. Heck, even anything in the *ahem* fake meat realm? Yup, covered there too. One area that we absolutely, sorely lack, though? Cheese. Definitely cheese. The edible kind, I mean, we got plenty of lame jokes. The cheese shelf at our local shop is literally only a few feet by a few feet, but it's stockpiled high with all sorts of stuff that admittedly, I usually pass on by. Some forays have been pretty successful, others not so much, but by in large Sandy and I keep to the bag of shredded cheddar or whatever we need for the week and move on by unless something really catches our eye. Apparently there's been a very elusive caramel-washed gouda out there recently that we just haven't been able to track down, much to our disappointment. 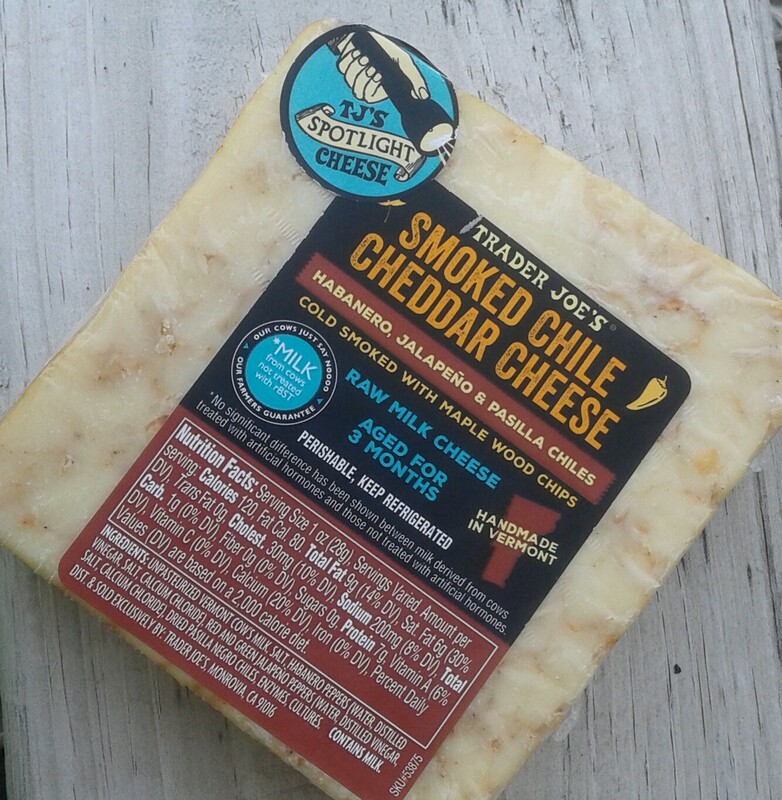 However...Trader Joe's Smoked Chile Cheddar Cheese. Try to tell me that doesn't sound delicious, and I will laugh at your folly. It probably helps that it is currently TJ's "spotlight cheese" making its existence all the more obvious folks like us. This cheddar isn't perfect, but man, it's still pretty good. There's three kinds of peppers in play here - habanero, jalapeno, and pasilla, the last of which I haven't heard of till now. Pennsylvania suburban bringing up, y'all. With that peppery tango, you'd be right to think there's a potential fiery furnace awaiting any bite, and. well, that's only about partially true. The chiles seems to be somewhat unevenly marbled through out the chunk we procured, leaving some bites tamer than regular ol' pepper jack, but when you hit a vein, there's a lot. Yet even those bites seem to be tempered by the overall soft creaminess of the cheddar, which I did not fully anticipate being that way. When I see "aged for three months" and "handmade in Vermont", I bank on many past experiences of plowing through as many cheddar samples as possible at the Cabot Factory Annex Store in Waterbury, VT (right down the street from the Ben & Jerry's factory - tradiotnal first and last stops on the annual family vacation to Vermont) expecting a certain kind of kinda drier sharpness. Maybe not overly sharp, but still something, so the fact that this is fairly mild cheddar was a surprise. If it were sharper, the spiciness of the peppers would stand out a little bit more in juxtaposition, making a more distinctive flavor, methinks. 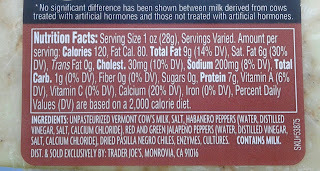 Instead, TJ's opted for a smoother flavor meld which may be appreciated by the masses, but results in more or less an edgier pepper jack-esque concoction. 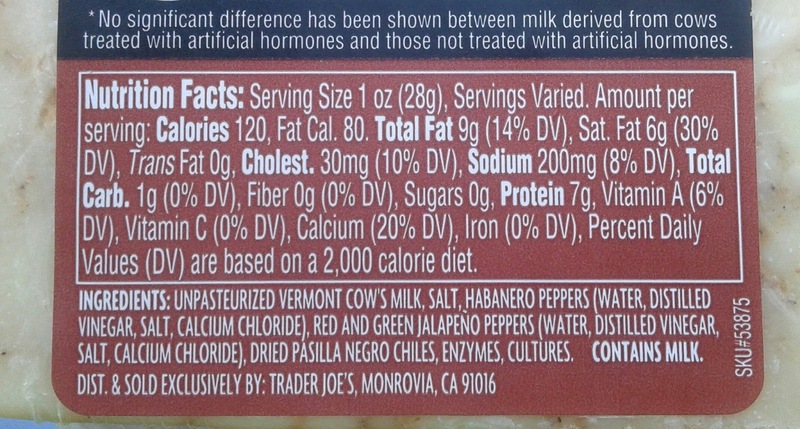 The other descriptors on the label, such as "cold-smoked" and "made from raw milk" might have some more sway over others than me, but there's not much (if any) difference I can discern from those factors. Feel free to fill us all in on the comments below. Still, for a very reasonable $8.99 a pound (our piece cost maybe $3.50), both Sandy and I were pretty happy, although our cheese-lovin' toddler was not exactly a fan. We tried to tell her no, but you parents of almost three year olds know how that can go. We've had only plain chunks but would love to shred some over some black bean soup or melt into a grilled cheese. I'm sure we'd buy it again, and perhaps this will help re-pique our interest into the too-oft ignored corner of TJ's-dom. I can't wait to try this. I love most of their cheeses. I especially love their English cheddar with caramelized onions. Had that thought too, alek, but didn't see anything matching the description on the Cabot website. Cabot is pretty darn good all the way around, though. Possibility it is exclusive to Trader Joe's. How strong is the "smoked" flavor? I love spicy but not so much for smokey. Didn't pick up too much smokiness, so I'd say it's fairly subtle from what I had. I'm kinda creeped out, because I randomly picked up this cheese days ago. Yep, it's pretty good, wish it had a little more cheddar 'bite.' Smokiness is indeed subtle, less than, say, the smoked gouda slices. Not bad but English Coastal is still my fave TJ cheddar! P.S> The cheese section at my TJ's is about 12-15 feet long, and full height, bottom rack to high shelf. And this is NYC. You need to get your cheese area expanded! !